Our almost two-year-old vacuum cleaner has been showing a lot of signs that it wants to retire soon. We can't blame our tiny cheaply bought vacuum cleaner. After two long years of hardwork, it deserves a break. We are now spending some time looking for a worthy replacement. 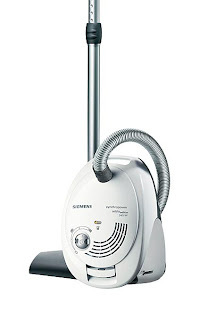 Siemens VS 06G2401 is priced at 995 Swedish crowns. Not bad at all! We are still on a "thinking-thinking" mode as of the moment. We'll update you guys later on this one. Oo nga eh, ready na talaga ako for Spring and Summer eh. Thanks for adding my links ha? Hugs to you too! i have sweeper too! heaven sent hihihi!